You've heard of a Volkswagen. But a Volksempfänger? The Volksempfänger ("People's Radio") was introduced in Germany in 1933 upon decree by Hitler's propaganda minister, Joseph Goebbels. The low price of the deluxe model—the equivalent of two weeks' pay—made the Volksempfänger affordable to most working families; and a cheaper model—nicknamed the Goebbelsschnauze ("Goebbels' snout")—could be bought on store credit by the unemployed. Goebbels' idea was simple: the Volksempfänger would assure "no one can break out." Brainwashing was was baked in. 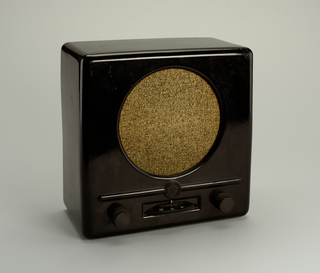 The Volksempfänger's dial only let listeners find German and Austrian stations; and the lack of shortwave reception made it impossible to listen to foreign broadcasts, unless you added an antenna—a criminal offense that was punishable by confiscation of your radio, a fine, imprisonment in a concentration camp, or death. At the Nuremberg Trials, Hitler's armaments minister Albert Speer told the judges, "Through technical devices like the radio and loudspeaker, 80 million people were deprived of independent thought." I sometimes wonder why so many of my fellow Americans cherish inane ideas. Then I remember, there's our version of the Volksempfänger.